Douglas B-26C "Invader", SNr.44-34376. Arrived in Bien Hoa (South Vietnam) for the "Farm Gate" operation at 1st. July 1963, as part of the Det.2A of the 4400th. "Jungle Jim" CCTS of the 9th.Air Force, under operational command of the 2nd. 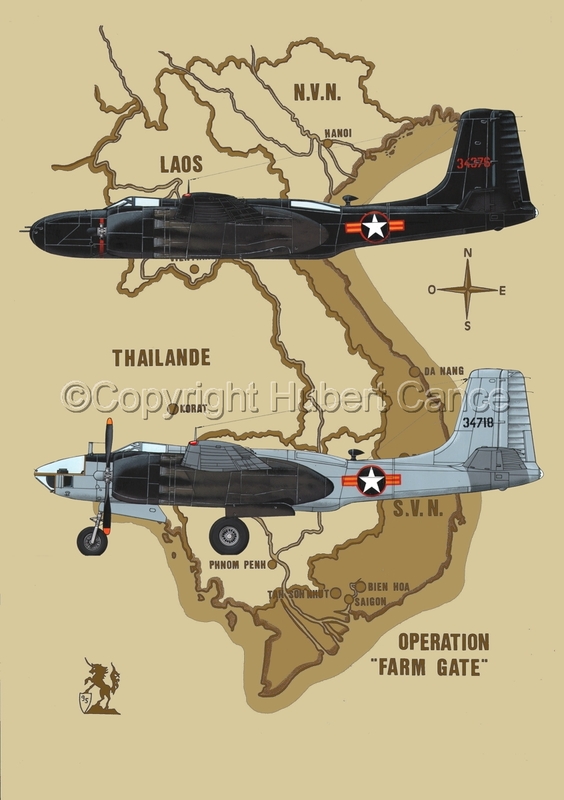 Air Division of the Pacific Air Force of the USAF, and wearing markings of the VNAF. Previously used for "Haik" operation in Indonesia. Douglas RB-26L "Invader" SNr.44-34718. Arrived in Bien Hoa, (South Vietnam) for the "Farm Gate" operation at 3rd. March 1963, as part of the Det.2A of the 4400th. "Jungle Jim" CCTS of the 9th.Air Force, under operational command of the 2nd. Air Division of the Pacific Air Force of the USAF, and wearing markings of the VNAF. Operational at 5th. March. Serving during "Mill Pond" Operation in Laos (1961) previously her conversion as RB-26L by General Dynamics at Fort Worth (1962) for "Sweet Sue" project (Photo-Recce nose modification). Acrylics and ink on Bristol card. CAD modified to be inserted in a background including a map of "Operation Farmgate". 7" x 5"12.75" x 9"18.5" x 13"24" x 17"29.75" x 21"32.75" x 23.25"